Beginning shortly across Fife is this year’s tour of Fife Contemporary’s Craft Pods. 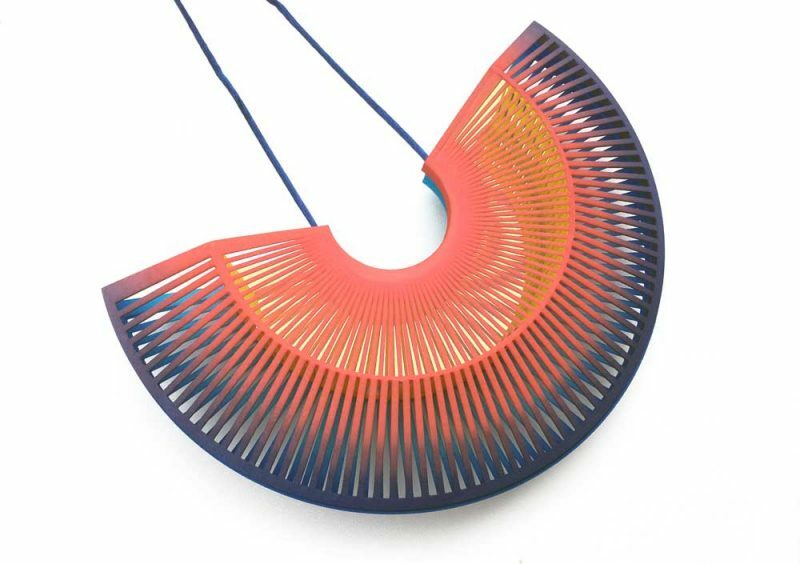 We are delighted to be featuring in them work by Lynne MacLachlan, a Glasgow-based artist who creates wearable, sculptural pieces which she 3D prints. Lynne originally trained and worked as an aerospace engineer before re-training as a jeweller. Her former career path seems to have influenced her innovative approach to the design and execution of her large-scale sculptural jewellery pieces. She experiments freely with digital tools. Stretching the boundaries of ready-made software and 3D printing, she achieves complex, openwork forms that could not be created by any other method. She then hand-finishes them using techniques such as dyeing, polishing and fabrication. For the Craft Pods’ display, we will be showing examples of her jewellery and useful background material in the two pods. Larger pieces of Lynne’s work (which were supported by an Inches Carr Trust Craft Bursary) will are on show in ‘Nexus: Meetings at the Edge‘, an exhibition organised by Fife Contemporary and Ruthin Craft Centre and curated by Dr Elizabeth Goring. It will be shown first at Kirkcaldy Galleries (31 March 2018 – 10 June 2018) before touring to Ruthin (29 September – 18 November 2018). Visits are also planned to various Fife schools but these venues are not open to the public.